A grand conspiracy was launched to acquire Arden (me, Paul) a Laurel by our Sneaky Patron Baroness Dorren of Ashwell and her compatriots in crime. Deviously working literally under my nose for months, they managed to keep me fully in the dark until the ceremony itself, which took me completely off guard. 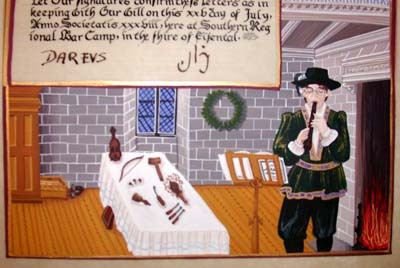 NOTE: for those who have no idea what I'm talking about, I belong to a medieval and renaissance recreation association call the Society for Creative Anachronism, where I am active in playing music, fencing, archery and some other things. Mostly I'm known as a musician and bard, Arden of Icombe (we use persona names within the society). A couple of years ago I had earned a Maunche, which is the East Kingdom award for arts and sciences (specifically in my case, for music). The East Kingdom consists of the Northeast United States, Quebec and the farther east Canadian provinces. 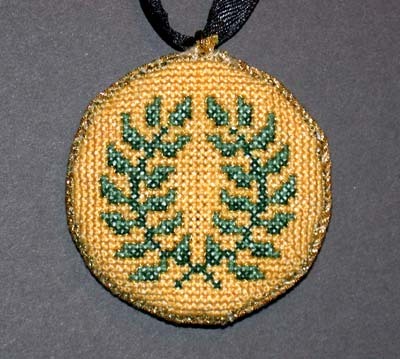 A Laurel is a Society wide (meaning whole world, technically) award for arts, but it also grants what is called "peerage" or a kind of noble standing within the society, implying that you are not only good at your art/science, but that you are courteous, generous, and otherwise exemplifying the medieval/renaissance ideals of a good and noble person. At this point I have no images, but might acquire some at a point in the near future to add here. This occurred at the Southern Regional War Practice (which took place at the Ukrainian Homestead, fairly close to Jim Thorpe, PA), at the Royal Court in the afternoon. I was called up to the royal presence, though had no idea why. Presently all of the branslers and other friends descended on the front court area, bearing a banner of my coat of arms (the White Raven) and other goodies at that time not visible to me. At this point it was announced what this was all about (making a Laurel), and the various members of the different orders of peerage were called to speak for/recommend me. Sir Jan Janowicz Bogdanski, (of the Order of Chivalry - the Knights) was the first to speak (and I later learned this was his first peerage recommendation - given his nervousness at that, I think he did a great job!) and spoke eloquently of music, generousity, and my contributions to his and other people's experiences. He also had a really pretty sword (I'm something of a sword fanatic, and he had a really nice one!). A Companion of the Rose (former Queen) was called upon next, in the person of Duchess Gabrielle (the Queen who had granted me my Maunche, actually), who spoke briefly but very nicely to recommend me. 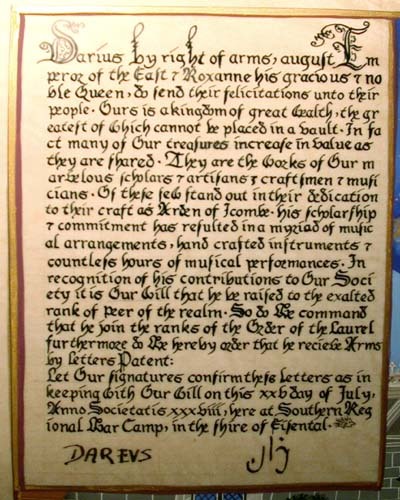 The Order of Pelican (service to the society) was represented in absentia by Mistress Dorren of Ashwell in a elegantly written letter that was read before the court. 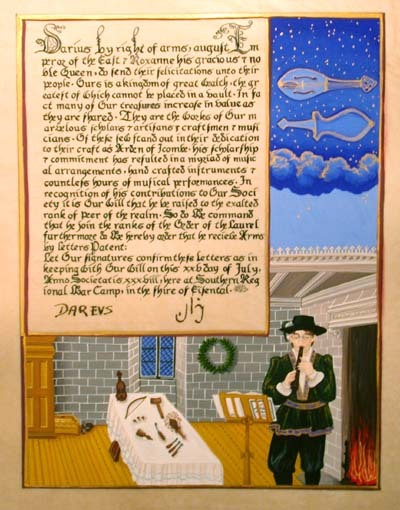 The final Order of the Laurel was represently by the head of the Bardic College, Lynnette, who gave a most rousing speech, noting just how many lives my teaching and music have reached, which was very satisfying to know. Having been thus recommended to the royalty and accepted, I was presented with the regalia of office. 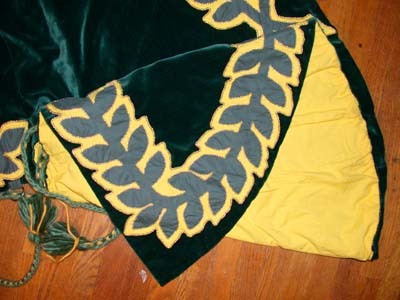 A Laurel is presented with a set of regalia to represent the office. 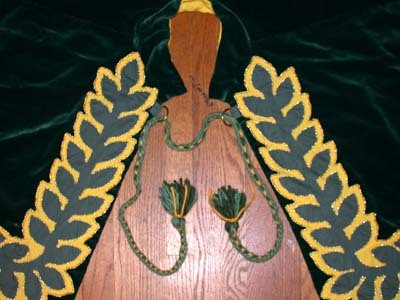 They include a medallion (to be worn as a badge of office), a cloak, a wreath for the head, and a garter for the leg. My friends and wife put out a truly massive effort and produced a particularly wonderful set of items that I would like to share here. 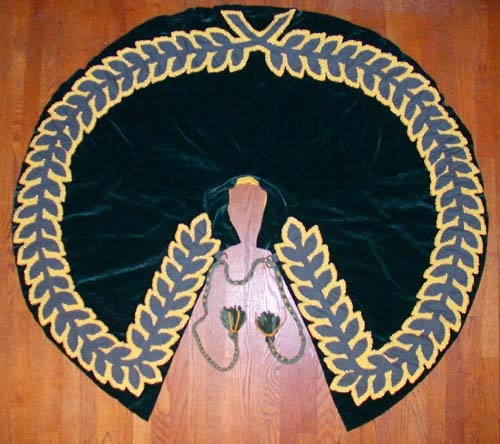 The Laurel Wreath crescent is the symbol of the office. THE MEDALLION embroidery by my wife Cluaran, which was then mounted into medallion form by Rowan and Siobhan. THE CLOAK constructed in elaborate applicee by Mistress Dorren. It is dark green velvet with a yellow liner. The cord I was done by Zoe. 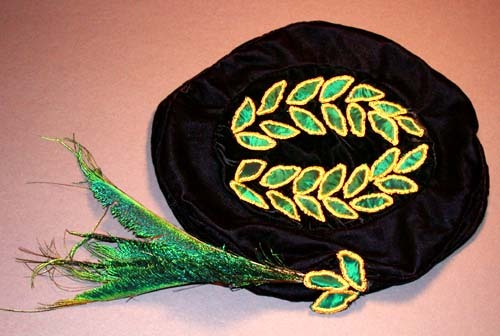 THE WREATH in the form of a Renaissance Flat Cap. Nice embroidery by Giannotta, complete with peacock feathers! THE GARTER tablet woven by Grainne I (Jenny) - its even reversible! The scroll shows me playing a recorder. On the table (and in the sky) are the rebec and citole that you can find on the historical instrument pages above. In the back corner is my rabbit Thistle crouching by the Hurdy Gurdy. Will be added in shortly!